In a mixer, cream the butter and sugar together, on medium high speed for approximately 5 minutes. Add eggs one at a time until combined. Slowly pour in the milk and half of the Sparkling ICE to the mixing bowl. With the mixer on slow speed add the flour, baking soda, baking powder, and salt until just combined. The dough should look shaggy. Slowly pour in the remaining amount of Sparkling ICE on medium speed for 2 minutes. Tear 2 pieces of parchment paper the size of a baking sheet. Line the first piece of parchment on a clean baking sheet and heavily dust with flour. Turn out the dough onto the floured parchment and press evenly till its about 3/4 inch thick. (If the dough seems too sticky flour your hands before pressing.) Lightly flour the top of the dough and place the second piece of parchment over the dough. Refrigerate for 3 hours or overnight. In a deep frying pan, heat enough oil to come up 2 inches from the bottom to 375 degrees using a candy thermometer. Gently peel the top piece of parchment off the dough. Using a floured donut cutter, punch out dough and place in hot oil. Fry on each side for 2-3 minutes or until light brown. Adjust the heat if needed. Scoop on paper towel lined baking tray. Combine cinnamon and splenda in a large bowl. While the donuts are still warm, toss with cinnamon and splenda mixture until evenly coated. Serve warm and enjoy! These donuts do sound really good, real donuts, not cake made in a donut form, and using Splenda like this I’d like to try it! 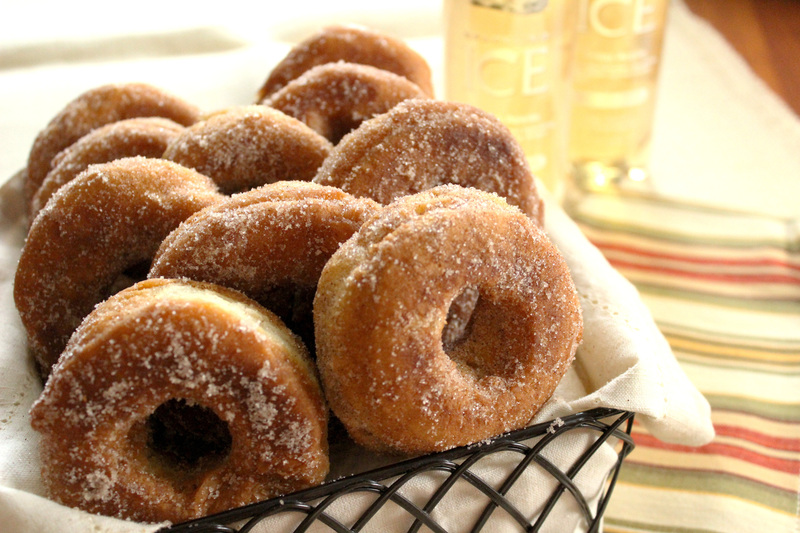 Crisp Apple Donuts recipe seems fun and tasty. I think I would enjoy these and less calories is best too!